UMBC’s Ryan Odom has been named 2017 recipient of the Joe B. Hall Award, CollegeInsider.com’s honor recognizing the top first-year Division I coach in the United States. Odom coached a remarkable turnaround season for UMBC men’s basketball, leading the team to a record of 21-13, and its first winning season since 2007-08. UMBC finished the year as the third most-improved team nationwide, and the team’s 21 wins represent the second-most wins in single year in the Division I history of UMBC men’s basketball. 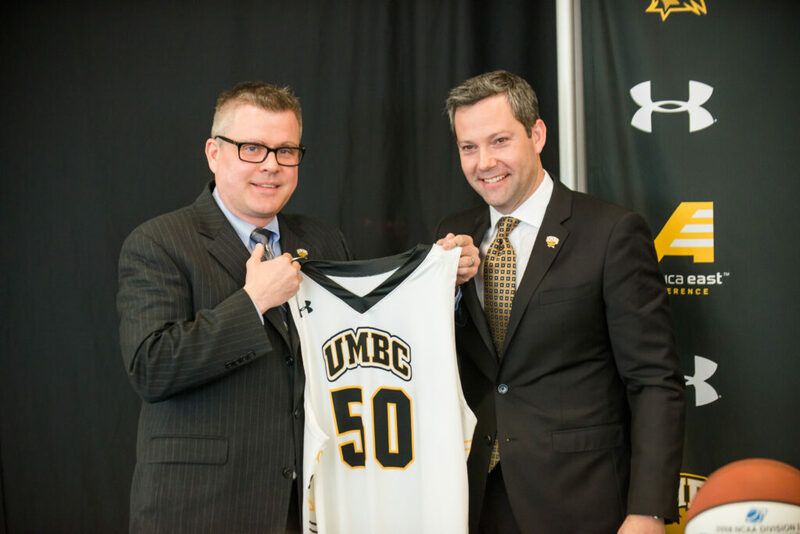 UMBC Athletic Director Tim Hall (l) and men’s basketball coach Ryan Odom (r) at the press conference announcing Odom as new coach in 2016. 2016-17 was truly a remarkable year for UMBC men’s basketball. With three wins in the College Insider Tournament (CIT), the team became the first in America East to win three games in a postseason tournament. The Retrievers also set new single-season records for points and three-point field goals, with Will Darley ’17, environmental studies, recognized as one of the most accurate three-point and free throw shooters in the nation. See the initial announcement of this award from UMBC Athletics, and media coverage in The Baltimore Sun and So Much Sports.